The following is a personality profile of Tennessee Williams based on his work. He is empathetic, he feels what others feel and is compassionate towards them. He is laid-back as well: he appreciates a relaxed pace in life. 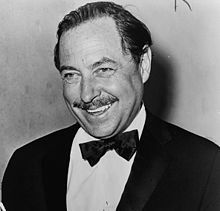 But, Tennessee Williams is also content: he is content with his level of accomplishment and does not feel the need to set ambitious goals. Considers helping others to guide a large part of what he does: he thinks it is important to take care of the people around his. He is also relatively unconcerned with achieving success: he makes decisions with little regard for how they show off his talents.